Antique Signed Tahan Paris, Pietra Dura Jewellery Casket Box and Original Key. 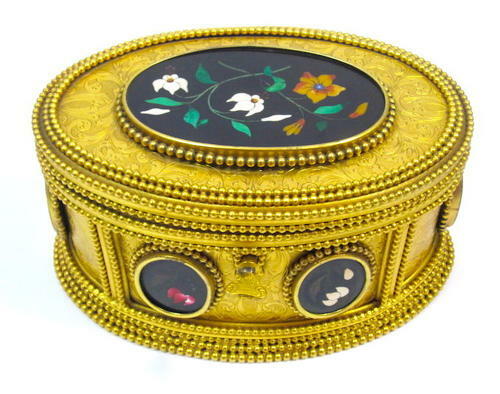 Stunning Box with 7 Pietra Dura Panels each Decorated with Beautiful Hard Stones, each Panel Depicting Flowers. The Plaques are Made of Dark Onyx and are Surrounded by a Lovely Pearled Baguette. Inside Original Cushioned in Red Velvet, Ideal to Put Jewellery In.